A train in India's northern state of Uttar Pradesh has collided with a vehicle packed with passengers, killing at least 15 people, officials say. 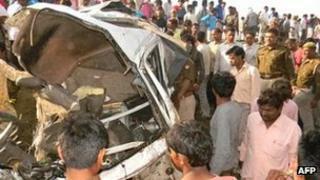 The crash happened at an unmanned level crossing near Madu railway station in Hathras early on Tuesday. The express train rammed into the jeep, which carried 17 passengers, dragging it along the track. Train accidents are common in India, which has one of the world's busiest rail networks. Railway officials said Tuesday's incident happened when the jeep tried to cross the track as an express train travelling between Mathura and Kasganj was approaching. Last July at least 38 people were killed when a train hit a bus carrying wedding guests at a level crossing in Patiyali in Uttar Pradesh. In May 2010 more than 100 people were killed when a Mumbai-bound express train jumped the tracks into the path of an oncoming goods train in West Bengal. The tracks had been apparently sabotaged by Maoist rebels. And in July 2010, more than 60 people were killed when a speeding passenger express hit another train waiting at a station in West Bengal. Announcing the budget for India's railways last week, Dinesh Trivedi - who has since been replaced as railways minister by Mukul Roy - said he aimed to eliminate fatalities on the busy network. A recent official report revealed that nearly 15,000 people die every year crossing tracks - a figure that the government described as a "massacre".